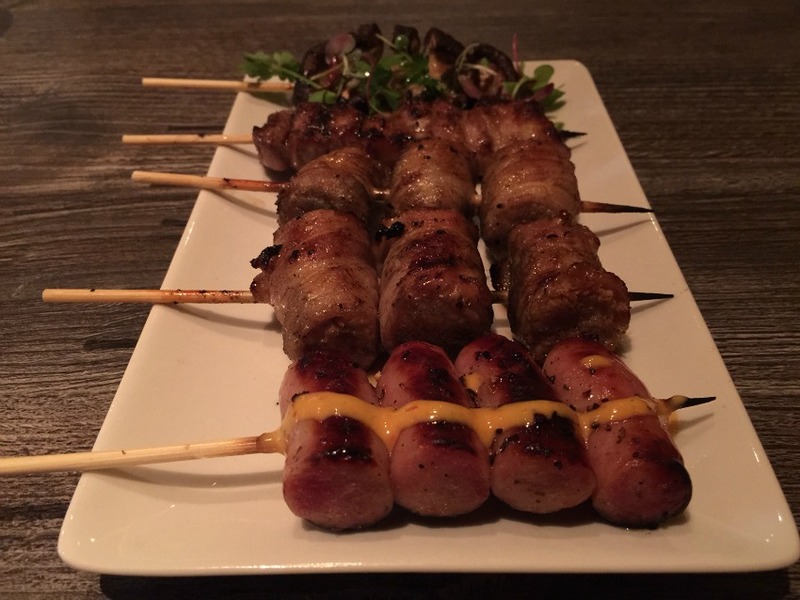 Pork sausage and other skewered meats are the way to go at The Backhouse in Koreatown. It’s no secret that there’s a lot to eat in Koreatown beyond bulgogi, bibimbap, and bo ssam. In the last couple years, the neighborhood has seen new, non-Korean destination restaurants like EMC Seafood & Raw Bar, Saint Martha, Escala, and even Roy Choi’s Commissary bring in crowds from all over the city. Now, The M2K Group, the operator of EMC, has added to the neighborhood’s dining diversity by opening an outpost of its robata and sushi spot The Backhouse in the same complex as EMC. The new restaurant/lounge, located on the third floor of the City Center on 6th development, has a bigger menu than The Backhouse locations in Burbank and West L.A. You can start with raw oysters—not surprising given that The Backhouse is above EMC—or toro rolls. But it’s the robata section of the menu that really brings the fun with its wide assortment of skewered selections. Do you want chicken meatballs with or without cheddar cheese? Would you like regular pork belly or braised pork belly along with your pork sausage? (You’ll want the sausage, we promise.) How about miso-marinated beef tongue or special thick-cut beef tongue? Should you do an offal tasting of chicken hearts, livers, and gizzards, and then chase that with some fantastic crispy skin or cartilage? Do you feel like having all your vegetables wrapped in bacon? Given that most skewers are about $3, you can keep ordering without worrying about maxing out your credit card. And this is Koreatown, so this place is open until 2 a.m. Take your time.